Millions of Americans reportedly got the alert message from the Federal Emergency Management Agency (FEMA) at 2:18 p.m. Eastern Time on their cell phones today. 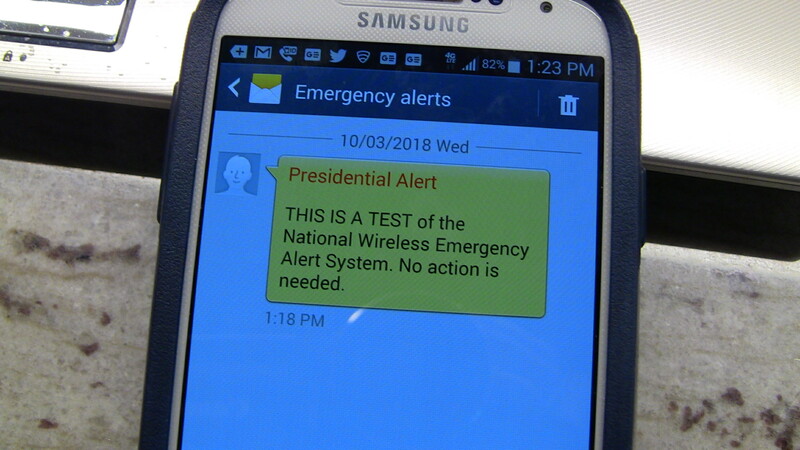 The text message in a yellow box said: “Presidential Alert—This is a TEST of the National Wireless Emergency Alert System. No action is needed. –1:18 p.m.
We nearly forgot about the National Wireless Emergency Alert, but at 1:18 p.m. Central Time today, our smartphones vibrated, buzzed and beeped. According to the Washington Post, you won’t get the alert on your cell phone, if your phone is turned off or if you’re not close to a cell phone tower. The presidential alert messages from FEMA and sent nationwide allows presidents to notify citizens of an imminent attack or terrorism on their cell phones. Today’s wireless emergency text message also will help FEMA and the FCC improve the current system. At 2:20 p.m. EDT, the Emergency Alert System was tested on broadcast stations. The test was originally scheduled on September 20th. It was delayed to today, Oct. 3rd due to Hurricane Florence. This entry was posted in Asian Community Alert, Community Alert, Houston News, National News and tagged National Wireless Emergency Alert Test. Bookmark the permalink.